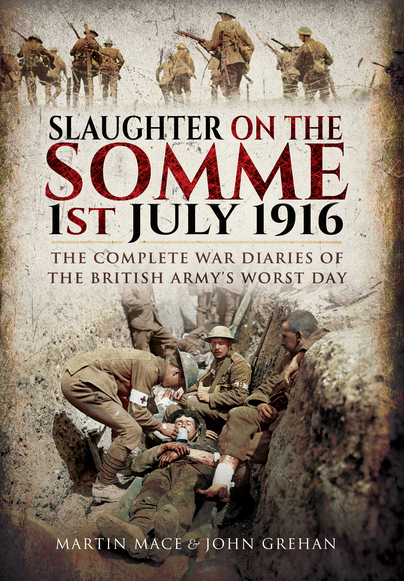 You'll be £16.99 closer to your next £10.00 credit when you purchase Slaughter on the Somme: 1 July 1916. What's this? In this publication, the authors have drawn together, for the first time ever, all the War Diary entries for 171 British Regiments that went “over the top” that day – a day which even now still touches so many families both in the United Kingdom and around the world. The result will be a vital work of reference to the events of 1 July 1916, a valuable information source for not only those interested in military history, but genealogists and historians alike. I can now urge you to go out (or click on the mouse – though I always encourage supporting your local bookseller) and get a copy of this book - but do not just put it on your bookshelf to use for reference. Read it – it can be difficult at times (emotionally and textually) but so very worth the effort. Despite – or for me, because of – the range of quality and content in the diaries, I just found this collection of the human experience to be wholly compelling. The authors have certainly historians a service with this work. In this publication, the authors have drawn together, for the first time ever, all the War Diary entries for 171 British Regiments that went "over the top" that day - a day which even now still touches so many families both in the United Kingdom and around the world. The result is a vital work of reference to the events of 1 July 1916, a valuable information source for not only those interested in military history, but genealogists and historians alike. This isn't really a book that is designed to be read through in a single go. This is partly because neighbouring battalions tended to have similar experiences, so there is quite a bit of repetition, but also because the massive scale of the project means it all becomes a bit overwhelming if you do. Instead it is best seen as an utterly invaluable reference guide, to be used to research the actions of an individual battalion, division or corps, or a particular part of the battle. Having said that, reading a large series of the diaries in sequence does give you a very good feel for the way in which the events of the day differed on different parts of the front. The book moves from north to south, so we meet the least successful parts of the attack first, and end on the border with the French, where XIII Corps captured most of its first objectives and one division achieved all of its objectives for the day. This is a very impressive piece of work, and an invaluable reference work for anyone interested in the battle of the Somme. A fascinating read and highly recommended. In 'Slaughter on the Somme', historians Martin Mace and John Grehan have, for the first time, presented the war diaries of those battalions which went over the top on July 1 1916, to form the most comprehensive and unique narrative of that fateful day. The book has been formulated from transcribing literally scores of handwritten diaries, which given their age and the conditions in which they were written is no mean feat. The comprehensive scope of the book also means this will surely become a standard reference text for anyone from the amateur family historian to the academic scholar and will stand alongside other great works on the battle. This is a book that fully deserves your shelf space. This large and comprehensive work brings together the war diaries of those units of the British Army engaged in the first day of the Somme battles, 1st July 1916. It is an excellent work and one not to be overlooked. A scholarly work 9/10. [The diaries] form a compelling overview of the battle as it degenerated into a slaughter. A work of stunning dedication. Highly recommended.